Revised Academic Calendar for B.Tech I Year-I Semester regular during the year 2011-12 is detailed below. work may be conducted on second Saturdays. 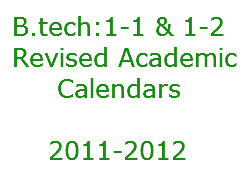 The Proposed Academic Calendar for B.Tech I Year-II Semester regular during the year 2011-12 is detailed below.